Stevens was a seeming contradiction: an insurance executive who was also one of the most challenging poets of his time. Central to his work is a faith in the redemptive power of the imagination, as well as the conviction that ultimately "Poetry is the subject of the poem". 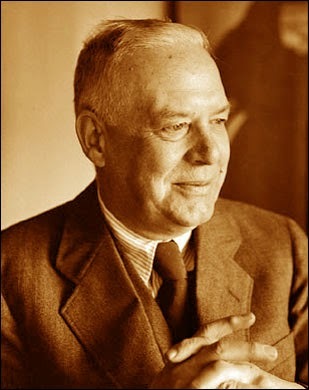 Wallace Stevens (1879 - 1955) is one of America's most respected poets. He was a master stylist, employing an extraordinary vocabulary and a rigorous precision in crafting his poems. But he was also a philosopher of aesthetics, vigorously exploring the notion of poetry as the supreme fusion of the creative imagination and objective reality. Because of the extreme technical and thematic complexity of his work, Stevens was sometimes considered a willfully difficult poet. But he was also acknowledged as an eminent abstractionist and a provocative thinker, and that reputation has continued since his death. In 1975, for instance, noted literary critic Harold Bloom, whose writings on Stevens include the imposing Wallace Stevens: The Poems of Our Climate, called him "the best and most representative American poet of our time." In 1914, under the pseudonym "Peter Parasol," he sent a group of poems under the title "Phases" to Harriet Monroe for a war poem competition for Poetry magazine. Stevens did not win the prize, but was published by Monroe in November of that year. Stevens moved to Connecticut in 1916, having found employment at the Hartford Accident and Indemnity Co., of which he became vice president in 1934. He had begun to establish an identity for himself outside the world of law and business, however, and his first book of poems, Harmonium, published in 1923, exhibited the influence of both the English Romantics and the French symbolists, an inclination to aesthetic philosophy, and a wholly original style and sensibility: exotic, whimsical, infused with the light and color of an Impressionist painting. For the next several years, Stevens focused on his business life. He began to publish new poems in 1930, however, and in the following year, Knopf published an second edition of Harmonium, which included fourteen new poems and left out three of the decidedly weaker ones. More than any other modern poet, Stevens was concerned with the transformative power of the imagination. Composing poems on his way to and from the office and in the evenings, Stevens continued to spend his days behind a desk at the office, and led a quiet, uneventful life. Though now considered one of the major American poets of the century, he did not receive widespread recognition until the publication of his Collected Poems, just a year before his death. His major works include Ideas of Order (1935), The Man With the Blue Guitar (1937), Notes Towards a Supreme Fiction (1942), and a collection of essays on poetry, The Necessary Angel (1951). Stevens died in Hartford in 1955. Stevens became interested in verse-writing at Harvard, submitting material to the Harvard Advocate, but he would be 36 before his first work was published in 1915. He soon was contributing to Poetry (Chicago), and his first book Harmonium was published in 1923 by the distinguished firm of Alfred A. Knopf. Though he was always much admired by his contemporaries ("There is a man whose work," Hart Crane wrote of him in 1919, "makes most the rest of us quail"), Stevens felt that the reviews of his 1923 book were less than they should be, and discouraged, wrote nothing through the 1920s. For a second edition of Harmonium, published in 1931, he added only eight new poems. When Stevens began to write poems with renewed fluency in the 1930s, he arranged for them to be printed in limited editions at the same time as trade editions were prepared by Knopf. Ideas of Order (1935) and Owl’s Clover (1937) were limited editions by the Alcestis Press, while The Man With the Blue Guitar (1937) and Parts of a World (1942) were printed by Knopf, and Notes toward a Supreme Fiction (1942) and Esthetique du Mal were deluxe volumes issued by the Cummington Press in 1942. In 1939, Stevens was sixty – an age when most poets are ready to look back on what career they might have made for themselves. But Stevens’s best writing still lay before him in the form of extended meditative sequences, quasi-philosophical in their ruminative wanderings but marked always by a vivid sense of the absurd and a darting, whirling inventiveness that took delight in peculiar anecdotal examples. In the loosely connected stanzas of these sequences, "Notes Toward a Supreme Fiction" (1942), "Esthetique du Mal" (1945), "The Auroras of Autumn" (1947) and "An Ordinary Evening in New Haven" (1950), Stevens perfected what had been, in effect, the work he had been producing all along – a metapoetry that took lavish delight in commenting upon its own making. At the same time, he began to grow interested in putting his thoughts on aesthetics together in prose sentences, essays he collected in 1951 as The Necessary Angel. And there was one final, magnificent turn to his development. Entering his seventies, he began to write a poetry of late old age, in which a sense of the disembodied, the purely mental, gave rise to a discourse that had grown newly austere, solemn, and strange even to its author. Capturing so exuberantly yet so flawlessly the mind at play with an extravagance most often associated with youthful pleasure, with the sheer delights of the sensual body, Stevens preferred to mask his very great sensual satisfactions by suggesting that his doings were in fact all a highly proper set of speculations on "the imagination." (His prose essays were useful allies in this strategy.) But the sheer verve of local moments, the sumptuous texture of outstanding passages, simply dissolves as pretense the notion that a philosophical enterprise might be underway. Few poets have so fully enjoyed not just their indulgence in their own language but also the game that elaborately insists no such indulgence is occurring.